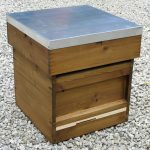 Our beekeeping products are constructed in good quality selected joiner grade pine. We can then arrange a mutually convenient time for collection. Current price list available for download (Adobe pdf Document – opens in a new window). Please Note: These prices are for collection only unless stated otherwise. We reserve the right to change specifications or prices at any time. We also cater for custom-made beekeeping equipment made to your own pattern or drawing. Quotations on request. **Note: Standard delivery charges relate to UK mainland only. We suggest that you contact your local Beekeeping Association for information and advice.